Hidden amongst the papers of Lee Thistlethwaite, deposited by his son Frank, stored in the treasure house that is the Anderson Room basement at the UL, I came across a battered envelope labelled “letters to Mr. Reynolds, oboe player in the Hallé”. H’mm, I thought, I wonder what’s in here. Opening the first of the letters revealed a confident, forward-sloping handwriting in black ink, with the signature Max Bruch. Max Bruch? Yes indeed, and that was not all – the other four were from Charles Hallé himself, Enrico Bevignani, August Manns and Auguste Vianesi. Together, these letters give a fascinating glimpse into Reynolds’ life. So, let’s go back a bit. 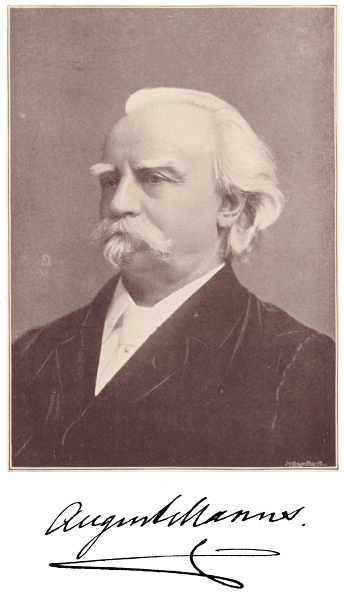 Charles Reynolds joined the Hallé in 1871, and was principal oboe until his retirement in 1916. He played under Hallé and Richter, and taught the young Leon Goossens. 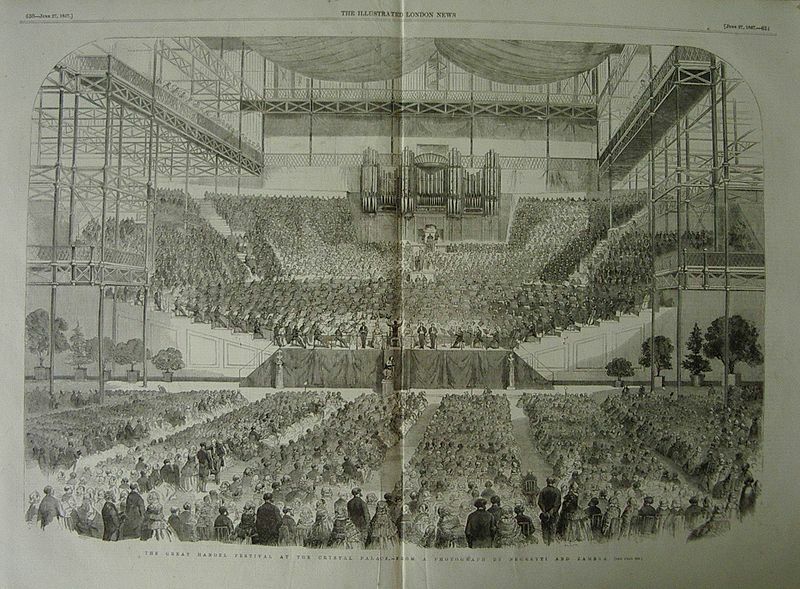 He also played in the Liverpool Philharmonic under Max Bruch from 1880 – 1883. The letters are here because Lee Thistlethwaite (of whom more in a later blog) purchased some of Reynolds’ effects after his death in 1917. The kind of thing that these days the orchestra’s fixer would send a text about. The second is from the conductor Auguste Vianesi who was putting together personnel for several operatic events including the opening night of the Metropolitan Opera in New York for Henry Abbey. He has clearly been in correspondence with Reynolds about possible players and this letter offers work to viola player Mr. Haslam, oboist Mr. Foreman and cornet player Mr. Saxby. Next comes the letter from Max Bruch. Dated March 1884, it is a reference for Reynolds. 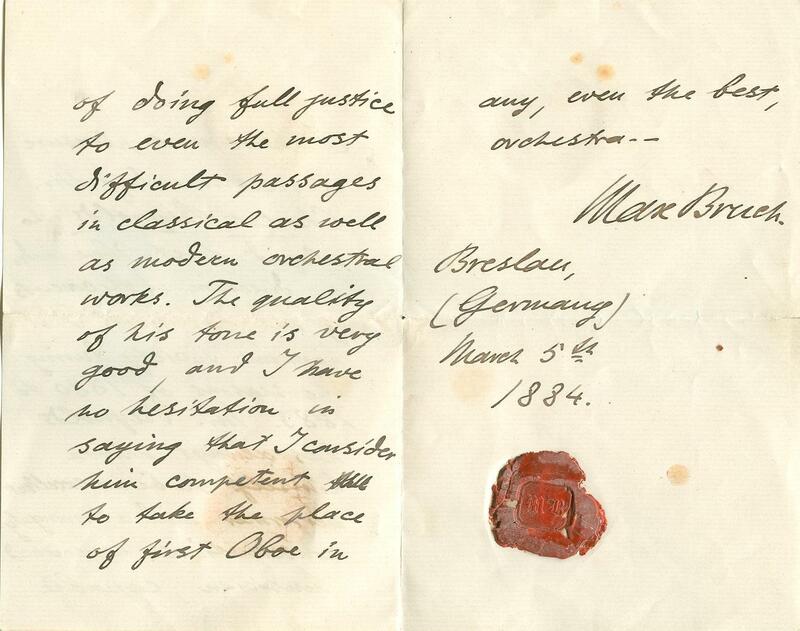 Fourth in the sequence is the letter from the conductor and composer Enrico Bevignani, dated April 1885, concerning Reynolds’ contract for a performance of Lakmé (a close search of Musical Times on JSTOR reveals this to be June 6th at the Gaiety Theatre). According to The Times, “Signor Bevignani conducted with care and energy, securing an excellent ensemble” (Monday 8 June 1885). So, what do these few letters tell us? That Reynolds was a busy professional player, working not only in the Hallé but also for others as opportunities arose. Clearly well-connected and certainly respected as a musician. They also demonstrate the importance of letters as primary research sources, and, to my mind at least, how important it is that they are well-documented. This entry was posted in Uncategorized and tagged C19 music, Cambridge University Library, Lee Thistlethwaite, Letters. Bookmark the permalink. 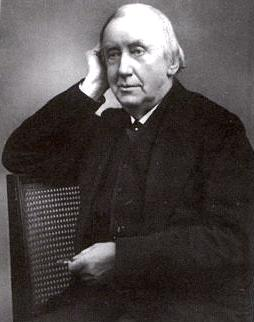 Charles Reynolds was the musical director of the Derby Castle Orchestra, Douglas, Isle of Man in the 1880s, at the time, the Island’s premier entertainment venue, later associated with Harry Wood, the elder brother of the composer, Haydn Wood. The young Harry Wood played under Reynolds in 1886 shortly after his arrival on the Island where he lived until his death in 1938 becoming known as Manxland’s King of Music. My book on Harry Wood is in preparation.